For many of those who regularly use TriMet’s MAX Orange Line, the days of commuting by car are in the rearview mirror. Two years into service, ridership averages about 67,000 trips per week, and it continues to rise. The total number of trips taken on the MAX Orange Line grew from 3,285,400 in its first year of operation to 3,484,200 in year two, a 6.1 percent increase. 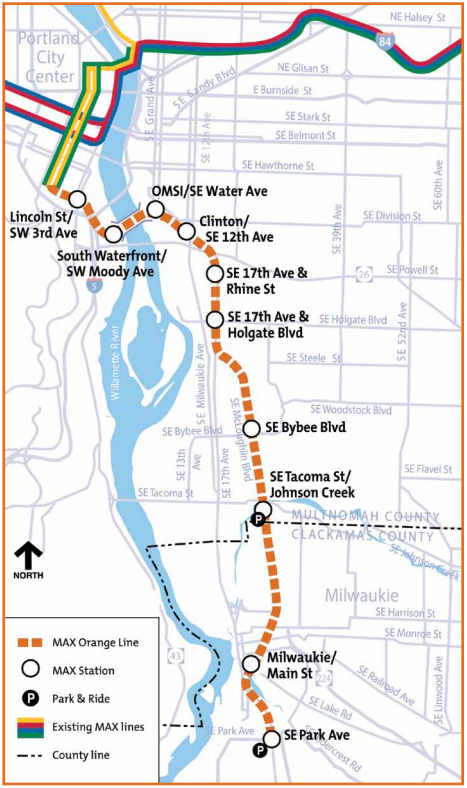 The MAX Orange Line runs between Portland State University, South Waterfront, inner Southeast Portland, Milwaukie and the Oak Grove community of North Clackamas County. Service is offered every 15 minutes or better. 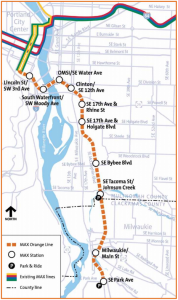 With each additional ride, the Orange Line provides better connections to jobs, education and other opportunities. The $1.49 billion Orange Line came in on time and under budget in the range of $48 million. Since its completion, the Federal Transit Administration (FTA) has allowed TriMet to use project funds to add back several deferred projects, including the installation of 14 additional shelters at the 10 MAX Orange Line stations. The installation, which began in September 2016, was expected to take a year to complete but finished a month ahead of schedule. The additional shelters feature the same rider amenities found at the original Orange Line station shelters, including flat screen arrival information, seating, security cameras and several other distinguishing features. Shelter columns are wrapped with locally made, handcrafted glass mosaics, as part of the agency’s Public Arts Program. 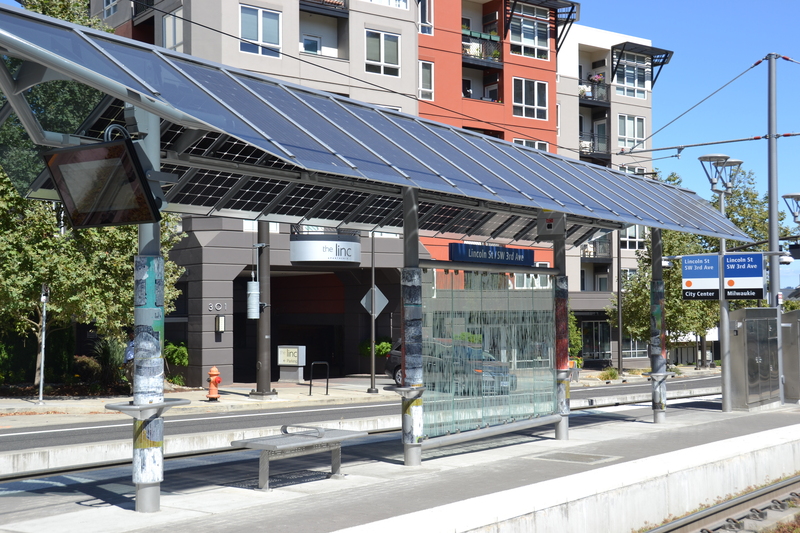 To support TriMet’s commitment to sustainability, shelters feature photovoltaic solar panels. The bi-facial panels generate electricity from both sides, taking advantage of both direct and ambient light. TriMet now has permission from the FTA to construct two additional deferred projects that will improve safety and access to MAX stations along the Orange Line. The Tacoma-Springwater Corridor Trail Pedestrian Connection will provide a direct connection between the Springwater Corridor Trail and the SE Tacoma/Johnson Creek MAX Station. This project is expected to be complete by December 2018. Still in the preliminary design phase is a plan to replace the Gideon Street Pedestrian Bridge—the aging original structure was removed as part of light rail construction in 2013. The new bridge will be the foundation for a safe, ADA-accessible walking and biking connection between SE Powell Blvd. and the Clinton area of the Hosford-Abernethy Neighborhood. The project is slated for completion in mid-2019. The Orange Line was also a boon for employment in Oregon, creating more than 7,200 direct and 7,300 indirect jobs. Nearly 600 private sector firms performed work on the project, including 134 Disadvantaged Business Enterprise (DBE) firms. TriMet’s DBE Program has become a national model for encouraging and supporting businesses owned by people of color and women when competing for contracts on transit construction projects. The 7.3 mile Portland–Milwaukie MAX Line is also the most environmentally focused light rail construction project in TriMet history. TriMet’s commitment to sustainability was reflected throughout the conception, planning, design, construction and operation of the system. The project incorporated bio-swales, eco-roofs and more than 4,000 square feet of eco-track, a first for Portland and the United States. Solar panels and LED lighting were integrated into the project, and regenerative energy systems capture and reuse braking energy from light rail vehicles. TriMet also chose contractors committed to sustainable practices and, when possible, selected construction materials that would reduce environmental impacts. MAX and TriMet’s expanding bus system help keep the region moving. These transit alternatives eliminate 202,000 daily car trips, ease congestion and help keep the air clean. Thanks to transit, freight and cars move more freely. According to the Texas A&M Transportation Institute, the region saves $150 million per year in congestion costs because of TriMet buses and trains. As we mark two years since the opening of the Portland-Milwaukie Light Rail Project, TriMet stands committed to offering safe, dependable and easy to use transit service that helps make our community the best place to live in the country. Happy Birthday Orange Line!